CATERWAULING: I haven't forgotten about you! I've been feeling icky since returning from San Jose, and I'm just now feeling like I have energy and time to do work and home AND blogging, so here goes. 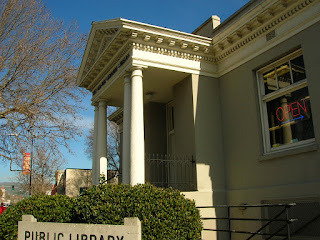 This is the little Carnegie library in 'da hood of San Jose - my friend Jim took us there. Cute! 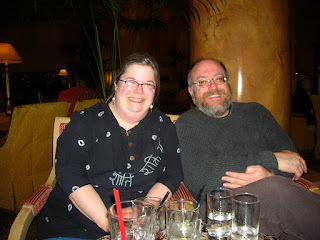 Here is Jim - we met his wife, Viki, too, and we had a great evening together having awesome sushi and then coffee outside. Lovely! I know Jim from the Wordcraft site - see the link to the right. 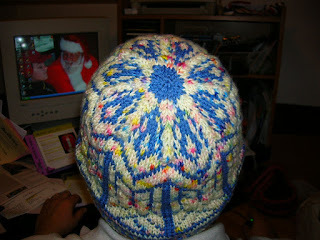 This is my Lillehammer hat. DH is modeling it for me, and it's his now. He's even given it a test-wear while birding last Saturday. He says it looks silly, but it sure kept him warm! Maybe it's a little too femme for him. Who shall get it, then? 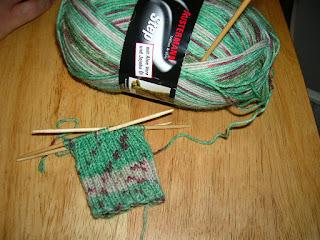 The moebius baskets and the Lamb's Pride Chunky yarn have, since I discovered them, inspired me to think about the new CML logo. It's the colors. 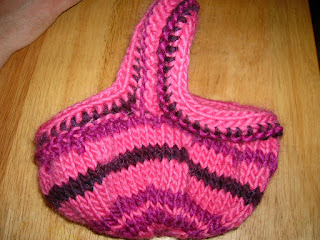 One of our PR folks is a pink addict, and I just finally got around to making this basket for her. I thought I'd snapped a pic of it after felting, but alas, I didn't. It awaits her return from her vacation on her desk, filled with pink candy.